TOKYO, Apr 19, 2018 - (JCN Newswire) - Asahi Shuzo Co., Ltd., Fujitsu Limited, and Fujitsu Laboratories Ltd. today announced that they will conduct a joint field trial to brew DASSAI sake, a rice wine brewed and marketed by Asahi Shuzo, using a Fujitsu Laboratories-developed predictive artificial intelligence model that supports the brewing of sake. By combining a mathematical model defining the process of sake brewing with machine learning that uses data obtained in the brewing of DASSAI, this predictive AI model technology will provide data to support an optimized sake brewing process. 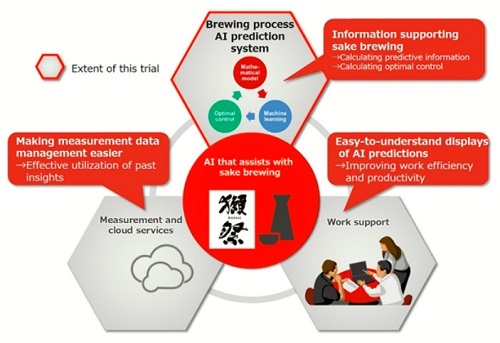 In this field trial, by using such technology in actual DASSAI brewing operations, Fujitsu and Asahi Shuzo seek to improve both the validity and the accuracy of the predictive AI model, while evaluating how practical AI can be in sake brewing. Through this field trial, Asahi Shuzo, Fujitsu, and Fujitsu Laboratories will use AI to support brewing operations, and will endeavor to consistently produce a stable supply of high quality DASSAI sake. Asahi Shuzo promotes a vision of "brewing sake for sipping and enjoying, not sake for drinking or for the sole purpose of sales," in its ongoing drive to brew sake with the utmost attention to quality. As Japan's society is aging, however, labor shortages are expected in sake brewing facilities, and there are concerns in maintaining a stable supply and the high quality of DASSAI. To address this issue, the company has been working for many years to record and systematize its experience in sake brewing. 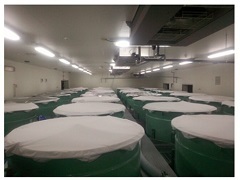 With the goal of ensuring stable procurement of Yamada Nishiki, a variety of rice ideally suited to brewing sake, from April 2014 Asahi Shuzo deployed Fujitsu's food and agriculture cloud, "Akisai," to farms where it had contracted to grow rice in an initiative to systematize and share agricultural techniques for optimal sake rice cultivation. Fujitsu and Asahi Shuzo have now launched a joint field trial to systematize the experience and knowhow of each employee with regard to brewing high-quality sake by applying Fujitsu's artificial intelligence technology, Fujitsu Human Centric AI Zinrai, to sake brewing. This trial will review and evaluate the applicability of the predictive AI model, which is developed with data accumulated by Asahi Shuzo, such as temperature and the proportion by weight of different ingredients, by calculating predicted values throughout the brewing process. In addition, the companies aim to improve the accuracy of the predictive AI model by incorporating actual data obtained on site during brewing, and the activities of employees based on their experience and intuition. This field trial will be conducted as part of Asahi Shuzo's DASSAI sake brewing process. The elements that make up sake and other data will be measured by Asahi Shuzo, and based on this data, the predictive AI model developed by Fujitsu Laboratories will be used to provide information supporting an optimal sake brewing process. Asahi Shuzo will undertake its sake brewing process with the goal of creating optimal sake, based on supporting information provided by Fujitsu and Fujitsu Laboratories. By conducting this field trial for two cycles, the companies will improve both the accuracy of the predictive AI model, and evaluate its effectiveness, as well as the practicality of AI in sake brewing. The predictive AI model developed by Fujitsu Laboratories is a technology capable of computing information to support optimized processes in sake brewing, by combining a mathematical model defining the procedure of sake brewing with machine learning using measured values for the components found in sake, based Asahi Shuzo's past brewing data and knowledge including the biological process of fermentation. Using the supporting information computed by the predictive AI model, Asahi Shuzo can optimally control the devices used in the sake brewing process. By incorporating the data gained from this field trial and the feedback from Asahi Shuzo, the companies will improve prediction accuracy and the sophistication of the supporting information, enabling the system to assist with even more optimized sake brewing. Asahi Shuzo, Fujitsu, and Fujitsu Laboratories plan to use the results of this field trial to further the practical usage of AI in the sake brewing process, with the goal of creating consistent, high quality sake.